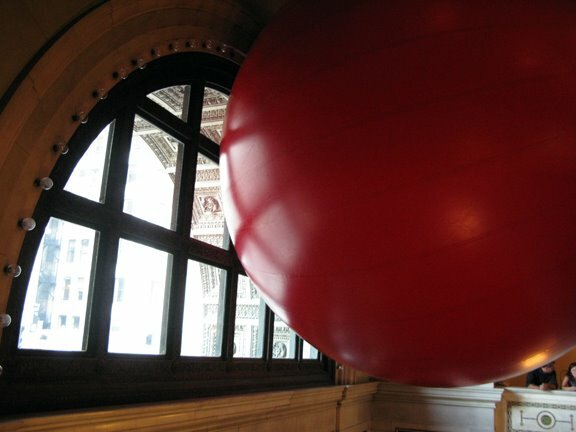 The public art “Red Ball Project” made its way through Chicago last month. It stopped just two blocks from where I work on its last day in town. 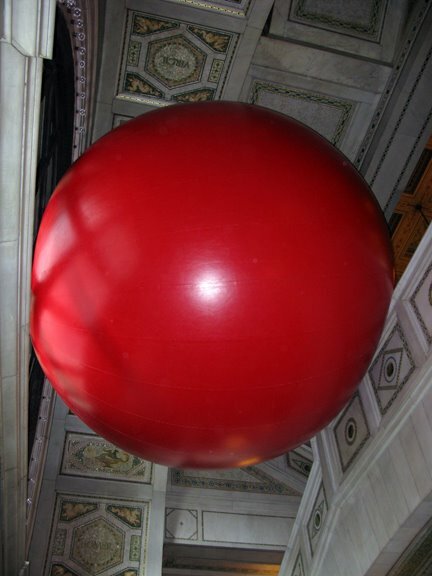 It was wedged in odd places all month and, finally, it ended up wedged above the entryway at the Chicago Cultural Center. 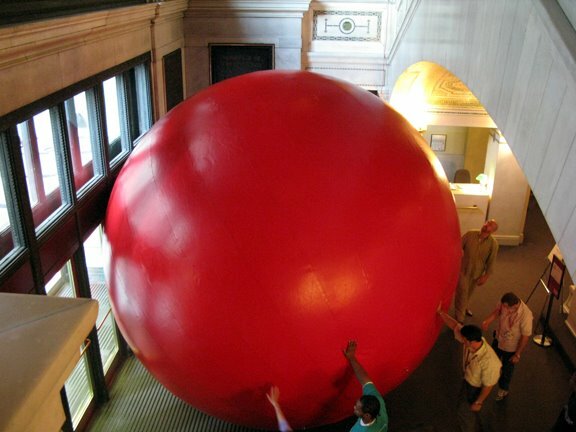 It’s a large soft vinyl ball that encourages interaction. You can touch it (although no punching because it was wedged near some windows). 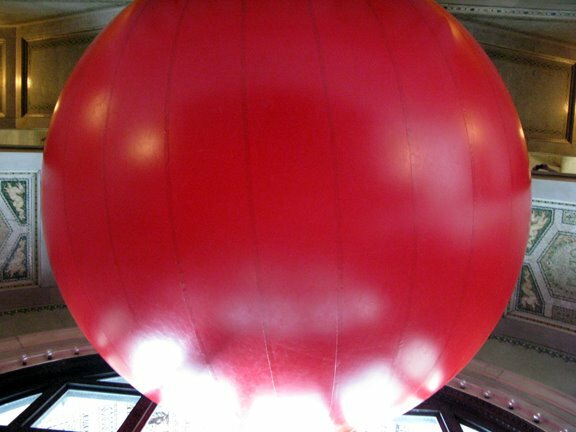 It was sponsored by Target (since they love large red balls, per their logo and store renovations in the Chicago area). It’s an unusual piece of art and, frankly, I don’t even know why I liked it so much. But I did! I really found myself charmed by its odd placement and general happy redness! At 5 p.m.–just after work!–I walked back to the site to watch them take it down. That was pretty neat. They put a pump on it and let it drain. 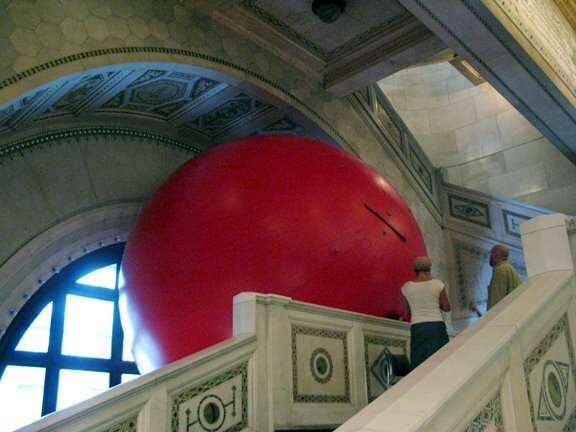 It got stuck and then quite unexpectedly–the artist thought it was stuck and was going to start taking more air out of it–plopped to the ground floor. That was fun. A team of volunteers ran up and started to deflate it. I left before it was deflated. But it was a fun workday diversion, for sure!